Hemostasis, the arrest of bleeding following vascular injury, is essential to life. 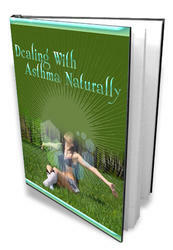 Within the vascular system, blood remains in a fluid state, transporting oxygen, nutrients, plasma proteins, and waste. When a vessel is injured, a dynamic interplay between thrombogenic (activating) and antithrombotic (inhibiting) forces result in the local formation of a hemostatic plug that seals the vessel wall and prevents further blood loss (Figs. 10-2,10-3, and 10-4). A disruption of this delicate system of checks and balances may lead to inappropriate clot formation within the blood vessel that can obstruct blood flow or embolize to a distant vascular bed. is. Vascular injury exposes the subendothelium (Fig. 10-3). Platelets readily adhere to the subendothelium, using glycoprotein (GP) lb receptors found on their surfaces and facilitated by von Willebrand's factor (vWF). This causes platelets to become activated, releasing a number of procoagulant substances that stimulate circulating platelets to expose GP lib-IIIa receptors and allow platelets to adhere to one another, resulting in platelet aggregation. The damaged vascular tissue releases tissue factor which activates the extrinsic pathway of the coagulation cascade (Fig. 10-4). The clotting cascade is a stepwise series of enzymatic reactions that result in the formation of a fibrin mesh.12 Clotting factors circulate in the blood in inactive forms. Once a precursor is activated by specific stimuli, it activates the next precursor in the sequence. The final steps in the cascade are the conversion of prothrombin to thrombin and fibrinogen to fibrin. 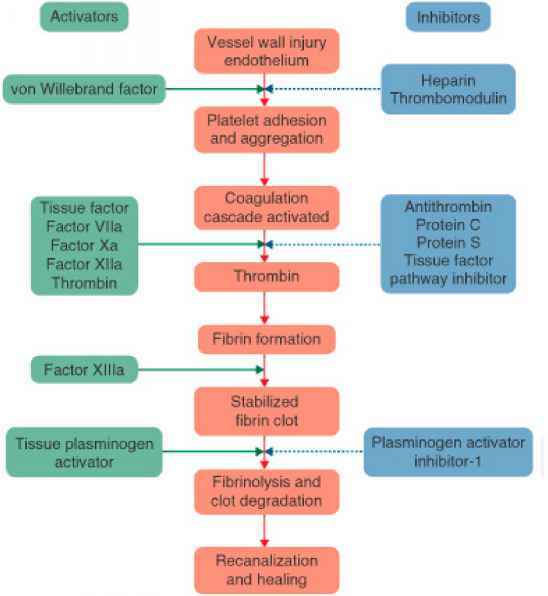 Thrombin plays a key role in the coagulation cascade; it is responsible not only for the production of fibrin, but also for the conversion of factors V and VIII, creating a positive feedback loop that greatly accelerates the entire cascade. Thrombin also enhances platelet aggregation. Traditionally, the coagulation cascade has been divided into three distinct parts: the intrinsic, the extrinsic, and the common pathways (Fig. 10-4). This artificial division is misleading because there are numerous interactions between the three pathways. A number of tempering mechanisms control coagulation (Fig. 10-2). Without effective self-regulation, the coagulation cascade would proceed unabated until all the clotting factors and platelets are consumed. AT and heparin cofactor II (HCII) are circulating proteins that inhibit thrombin and factor Xa. The intact endothelium adjacent to the damaged tissue actively secretes several antithrombotic substances including heparan sulfate and thrombomodulin. Heparan sulfate exponentially accelerates AT and HCII activity. Protein C and its cofactor, protein S, are vitamin K-dependent anticoagulant proteins made in the liver. 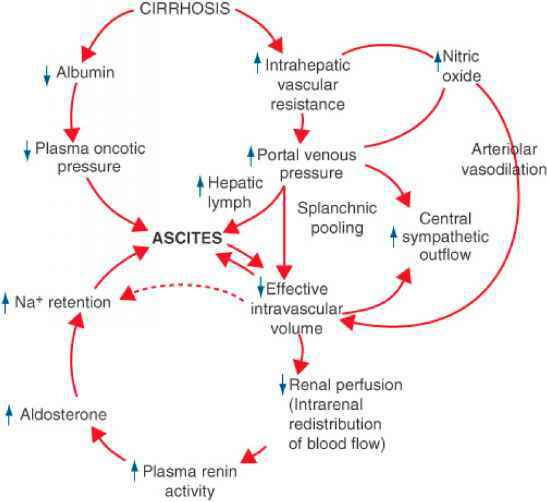 Activation of the clotting cascade activates protein C that, in turn, inhibits factor Va and Villa activity. Tissue factor pathway inhibitor (TFPI) inhibits the extrinsic coagulation pathway. When these self-regulatory mechanisms are intact, the formation of the fibrin clot is limited to the zone of tissue injury. However, disruptions in the system often result in inappropriate clot formation. collectively known as fibrin split products or fibrin degradation products. The fib-rinolytic system is also under the control of a series of stimulatory and inhibitory substances. Tissue plasminogen activator (t-PA) and urokinase plasminogen activator (u-PA) convert plasminogen to plasmin. Plasminogen activator inhibitor-1 (PAI-1) inhibits the plasminogen activators and a2-antiplasmin inhibits plasmin activity. Aberrations in the fibrinolytic system have also been linked to hypercoagulability.